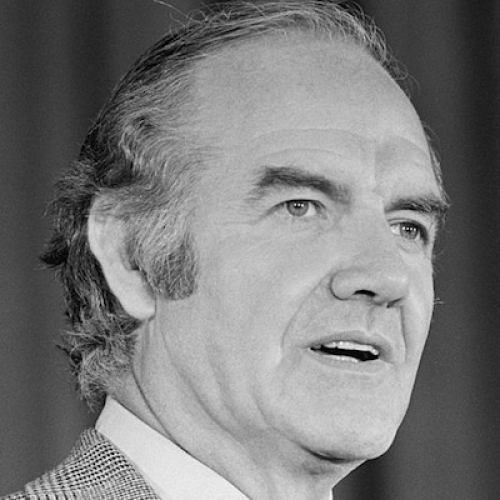 George McGovern, 1922-2012: Is Decency in Politics Always Doomed? To understand how deeply the moment of George McGovern's efflorescence differs from our own, pick up the biography McGovern authorized a young Time magazine staffer to write as he began his 1972 presidential campaign. The author, Robert Sam Anson, had been taken prisoner in 1970 by Communists guerrillas in Cambodia who put a gun to his head and made him dig his own grave. Anson dedicated the book to these guards! Then, in his preface, he wrote of their profound admiration for George McGovern as a reason why he should be President of the United States. The logic was a relic of the time. With the lying Richard Nixon following the lying Lyndon Johnson in the White House, the call for open, honest government associated with ascendent Baby Boomers -- and those same voters' longing for a quick end to the Vietnam War, even their suspicion we had picked the wrong side in that War -- seemed to suggest a candidate like McGovern, who had overseen the process of opening the Democratic Party's ossified boss-ridden nominating system, and pledged as president to remove all American forces from Southeast Asia within sixty days, was the Democratic future. Hindsight has been cruel to that syllogism. McGovern lost the presidency in just about the greatest landslide in history—in a campaign that ended up with much of Middle America judging liberalism itself as alien and obtuse. In fact, after 2012, a year in which a majority of Republicans voters believe another decent-seeming Democrat is so alien and obtuse he could not have been born in America, maybe McGovern's moment isn't so different from our own after all. The passing of George Stanley McGovern at the age of 90 on Sunday reminds us of this space between the longing for unapologetic good-government liberalism and its decimation in a fallen political world—in which the decent and honorable simply get crushed. Born in a tiny farming hamlet in South Dakota with a fundamentalist Methodist pastor for a father (surely a source of his intense moralism) and raised on the edge of poverty, McGovern flourished as a youngster, like Richard Nixon, in competitive debate. He was a star student at the local Wesleyan college, where he learned to fly a plane; after Pearl Harbor, he enlisted in the Army Corps and became a heroic bomber pilot. He came away with a sense of war's madness seared deeply into his soul—which helped make him a Cold War sketpic and a backer of Henry Wallace's left-wing 1948 presidential bid. The example of Adlai Stevenson made him a Democrat: the Illinoisan seemed to teach that a politician could still prosper while remaining above the nasty political fray. Now a college history professor (his dissertation was on the deadly labor wars in the Colorado coalfields in 1913 and '14), in an overwhelmingly conservative state he practically organized South Dakotan Democratic Party single-handedly. In 1956, when asked why someone as far left as he thought he could win a congressional seat there, he answered, "I can present liberal values in a conservative, restrained way. I see myself as a politician of reconciliation." Wouldn't you know it, he won—which instilled in him that belief so ubiquitous in the most ambitious politicians: that the ordinary rules of political gravity did not apply to him. It survived his defeat for Senate in 1960. John F. Kennedy tapped him to run the new Food for Peace program, which strengthened Cold War alliances by distributing agricultural surplus, and for the rest of his life he would distinguish himself as an advocate against hunger. In 1962, he finally won his Senate seat—by 527 votes. He was only back on Capitol Hill eight months when he discovered his defining issue—calling America's escalating commitment in Southeast Asia "a policy of moral debacle and political defeat." The Gulf of Tonkin attacks, which put Vietnam on the map for the rest of America, was a long year away. In 1968 he repaid the Kennedy family's favor by standing in for the slain Robert F. Kennedy as a candidate at the 1968 Democratic Nation Convention. The remarkable thing: alone among Democrats, he took his pseudo-run seriously. Asked why delegates should vote for him against fellow anti-Vietnam War aspirant Eugene McCarthy, he responded, "Well—Gene really doesn't want to be President, and I do." Incredibly, little more than sixteen months later, he made the earliest presidential candidacy announcement in history. Las Vegas oddsmaker Jimmy the Greek gave him a 50 to one shot for the 1972 Democratic nomination. But he won that nomination. And the unlikely victory seemed to vindicate an abiding liberal fantasy, which President Obama sometimes seems to share: that if you just show yourself to be decent enough, the skeptics cannot help but come around. The Nixon campaign against him was merciless, demolishing his old claim to wrap liberalism inside a conciliatory conservative rhetoric. One surrogate, Bob Dole, called him "as close as anyone has yet come to urging outright surrender"; another, Senator Hugh Scott of Pennsylvania, tabbed him the candidate of "acid, abortion, and amnesty"; a "Democrats for Nixon" commercial, portending Mitt Romney's infamous remarks in Boca Raton, said his proposal for a guaranteed minimum income -- which was not much more generous than Nixon's own proposal for a guaranteed minimum income -- would make 53 percent of the country vassals to the other 47. The last Gallup Poll had him down 59 percent to 36. And yet the abiding liberal fantasy survived even that. James Reston, in his column the Sunday before Election Day, said "the thought that the American people are going to give Mr. Nixon and his policies and anonymous hucksters and twisters in the White House a landslide popular victory ... is a little hard to imagine." McGovern's idealistic young aides predicted victory outright. (Said one: "There's no way we can lose Texas.") Even after the landslide a novel called President McGovern's First Term held fast to the fantasy—imagining that had McGovern only run a last-minute ad inviting voters to ask, "Do I really trust Richard Nixon? ... Do I want to contribute to giving him a blank check, a license to do what he pleases for four long years?" he would have eked out a victory. The fact that in real-life McGovern had run exactly that sort of campaign didn't deter the novelist. One of his TV commercials displayed all the headlines correctly laying the Watergate scandal on the Oval Office's doorstep—and when reporters ignored Watergate as an election issue, in an astonishing speech to a conference of UPI editors, McGovern yelled at them, calling Nixon's "the most corrupt administration in history...and every one of you in this room knows it." In another astonishing speech—well, it wasn't really a speech at all: instead, the candidate just played a recording of a Vietnam veteran saying, "I don't think the people really, really understand war and what's going on. We went into villages after they dropped napalm, and the human beings were fused together like pieces of metal that had been soldered." If only elections could be framed as referenda on decency. If only someone shooting straight from the hip could call Americans to their better selves. If only ... then the world would change. This, more than any alleged policy extremism, was the soul of McGovernism. But Americans were not prepared to be called back to decency like that. McGovern likely never suspected what Nixon aide Pat Buchanan revealed in testimony to the Senate Watergate hearing: that one of the of the goals of the Nixon reelection campaign's dirty tricks was to manipulate all the other viable Democrats except for McGovern into destroying one another, because they thought McGovern would be easiest to beat. Indeed, political aggression from his opponents seemed to baffle him; he simply never saw it coming. He was a good man in politics, perhaps too good; Mr. Christian, an aide entitled his memoir about him. Although he was a funny sort of Christian. He never seemed to accept that we live in a fallen world.